In one of the more circuitous ways I’ve found a book, I recently read a nonfiction book by Julia Cameron, where she talks about Nora Ephron’s career, and mentions an audiobook of Heartburn, read by Meryl Streep. I put down the book to search my library’s catalog and—yes, they had it! Requested on the spot. And when I listened to it, it was surprisingly funny and Streep was as good as I expected. The movie, when I gave that a try, was, on the other hand, much less satisfying. 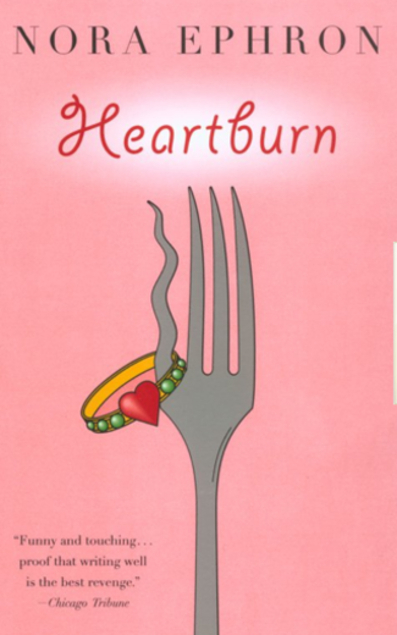 I’ve been reading more love stories this year, and Heartburn the book is something of an anti-love story. Instead of being about a couple falling in love, it’s about a couple falling apart. Rachel learns that her husband is having an affair while she’s seven months pregnant. In a circuitous narrative, Rachel tells us about what led them to here and about the aftermath, punctuated by occasional recipes—because she’s a food writer who tells family stories. I know this doesn’t sound funny. But there’s a dry wit and self-deprecating charm to Rachel’s voice that made tragic events surprisingly funny—while still being tragic. But it becomes a story about the absurd tragic comedy of life, which is quite different from a story about the tragedy of life. If you see what I mean. And along with a comedic edge given to the tragedy, some incidents are just genuinely funny. Today’s Book Blogger Hop question is: When reading a series, do you re-read the previous book/s before reading the newly released book? Sometimes yes. It depends on how much I like a series and how recently I’ve read the earlier books. Often if I don’t reread earlier books before reading the newly released one, I end up realizing that I’ve forgotten great swathes of things (like, say, the main character’s best friend. Or the twist ending of the last book revealing the villain is actually a good guy. It’s happened.) So in general I probably should reread the previous book(s) before reading a new one, but it really only happens if I enjoyed the previous book enough to want to read it again. When I reread series, I pretty much always read the entire series. So some, like Anne of Green Gables (eight books!) become a rather lengthy process. But it just feels incomplete to only read part, and very strange to just jump to the middle somewhere. Although I can think of a few series (the Oz books, the Bloody Jack series) where the quality is uneven, and I may only reread my favorites next time I revisit. It would be a shift in habits, though! What do you do when a new book in a series comes out? Rereading, or just diving into the new part of the story? Day 7 of this writing experiment was my jackpot day. I liked everything I wrote, some more than others, but Day 7 was when a run-away idea took hold and didn’t let go for most of the day. You know how people describe some books as ones they can’t put down? Once in a very great while I have an idea like that, that has to get typed up as fast as possible and won’t leave me be until it’s done. I love days like that. On Day 7, I set a personal word count record, typing around 6,000 words. That turned out to be about two-thirds of “The Princess Behind Thorns,” a kind of Sleeping Beauty story, though a great many things are different from the traditional tale. My story is about Princess Rose Amelia, who is very much awake, but trapped by a spell in a garden behind thorns. And the prompt that inspired it all was “The garden shrank at night.” Here’s a bit from near the beginning. Tonight was worse than it had ever been. She had been out on the wide lawn with her cats, so big a lawn that by day she didn’t even mind the thorns bordering the far side. Her latest two kittens, Silvertips and Emerald Eyes, were especially adorable today. She had been teasing them with a long grass stem, laughing at their antics, and she hadn’t noticed the descending sun until the shadows had nearly reached them. She looked up at a sudden chill on the back of her neck, scrambled instinctively backwards away from the reaching shadow of the thorns. It was long, so, so long, deep, deep black, and mere feet away from her. For a moment she tried to look through the shadows, to see the grass that had to be there, that had been there minutes before. In another moment she jumped to her feet, caught up a squirming kitten in each hand, and ran. She ran through her garden, heart pounding in her chest, ran through the paths she knew by heart, and shied away from even normal shadows. It wasn’t only the shadows. It was the noise. The sound of creaking, rustling, scraping branches. The thorns were moving, swaying and shaking and writhing. There was often a gentle, tricksy breeze in her garden, but the thorns moved like they were caught in a storm, a malevolent, howling storm. Except that there was no wind at all. She ran all the way to her bower, dropped the kittens and fell onto her bed. She hadn’t been a child for many, many years, but some buried instinct told her that she was safe with the blanket over her head. She lay huddled there, shaking, listening to the thorns moan, for a long, long time. The kittens scrambled in beside her, and only their warm furry comfort let her finally fall asleep. In the morning the sun rose and all seemed well. She walked the edges of her garden, exploring. Half-afraid of what she would find, eying any shadows suspiciously. But all seemed well. Until night, when the shadows reached out and the thorns moaned again. 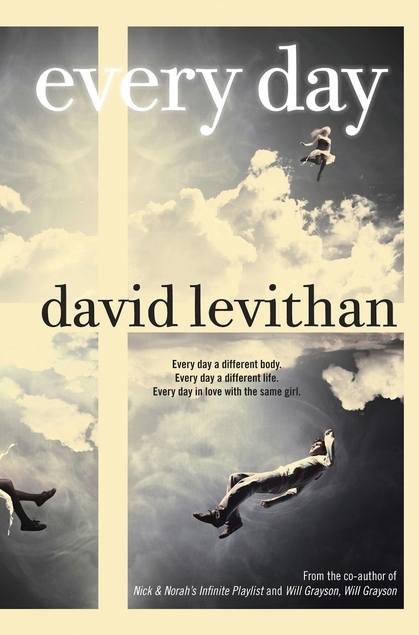 A friend recently recommended a book to me with an intriguing premise: Every Day by David Levithan. And it was every bit as intriguing as I hoped–and then some! Our narrator, A, wakes up in a different body every day. And it’s not that their body is changing–they’re entering a different person’s body every day, though always someone their own age, sixteen. They’re still themselves, but they have control, can access their host’s memories, and generally try to live that person’s life for that day. A has always been this way, and never known anything different. There are drawbacks, but they do okay–until they fall in love, and want to have their own life. Weird, right? But SO interesting! I listened to this on audiobook, and pretty much played it every spare minute I could until I got to the end. I was just totally hooked to find out how A/the author would navigate the next complication to arise, and to see what life A would be visiting the next day. This was also a very nicely done love story. I am usually not a fan of instalove romances (they’re a pet peeve, in fact) but this was one of the rare ones that really made it work. When A meets Rhiannon (while occupying the body of her boyfriend Justin), A is pretty immediately smitten. But it was such a nice blend of physical attraction, really seeing who she is as a person, and sharing a very meaningful, magical afternoon together, that it worked for me. Today’s Book Blogger Hop question is: If you could take the place of any fictional character, who would it be and why? The first one to come to mind is Dr. Watson. I don’t think I could be Sherlock Holmes, and besides, I’d want to meet Holmes, so it would be better to have Watson’s role. As long as medical knowledge wasn’t called for to help solve the case, I think I could be a decent Watson–even though I’m more squeamish than he is! I definitely couldn’t be Anne of Green Gables, but it would be nice to try being her friend Diana Barry for a bit. Or it might actually be more fun to be Ilse, friend of Emily of New Moon. I like Emily a lot, and Ilse can get away with wild statements and flights of passion that, while not really me, might be fun for a change! I see Mark check out Extra Caramel’s skirt as she goes by, and then he’s up to my counter. “Black coffee?” I say before he can. “You’re a saint.” He pulls out a crumpled five and a charming grin that looks equally over-used. He’s perfect for Extra Caramel. That’s why I sent her to the back. Because I know Mark will head that direction as soon as he notices Evelyn sitting in the front armchairs. Those two are not one of my matches. Anyone could see that Evelyn is much too smart for him. I’m not surprised she saw through him in a single date. I was only surprised he got her to go on one.